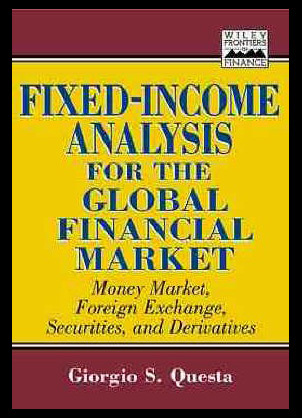 Fixed income analysis for the global financial market: money market, foreign exchange, securities and derivatives is a highly anticipated and respected publication from one of the leading experts in the industry. The author Giorgio S Questa provides a comprehensive and extensive account of the techniques and procedures involved within this fast moving and unforgiving industry. The main emphasis of the book is to provide you with a how to do on many of the main aspects of the market as well as showing you how to use the various data banks and chart systems that you will find in place.